made during the previous plan. UACJ Corporation made several major changes in 2018, setting new policies under a new mid-term management plan announced last May and reorganizing its management team, including my appointment as representative director and president in June. We are now pursuing fresh initiatives and challenges as the UACJ Group transforms into an enterprise that offers solutions tailored to customers’ needs by leveraging its diverse strengths. *1 Collective term for automobiles, aircraft, ships, etc. Today, expectations for aluminum’s benefits are on the rise, especially with respect to the metal’s environmentally friendly applications. Just as the beverage can industry switched to aluminum in order to facilitate recycling, the automotive and other transportation-related industries have recently begun replacing steel with aluminum on a global scale. Capitalizing on the opportunities accompanying this shift, UACJ is striving to offer even better solutions so that it can continue raising corporate value and contribute to a more sustainable environment and communities in the future. During the first half of fiscal 2018, from April 1 to September 30, 2018, the global economy continued to grow at a moderate pace. Nevertheless, the United States government pursued various protectionist trade policies, prompting the Chinese government to respond with retaliatory measures. Due to those developments and other factors, the outlook for the global economy remains uncertain. Against that backdrop, the Group’s flat-rolled aluminum products business cut back production of can stock in Japan due to natural disasters, including flooding in the western part of the country, and to sluggish demand for canned beer despite solid demand for low-alcohol beverages. Consequently, sales volume of can stock decreased in the first half of fiscal 2018 compared with the same period of the previous fiscal year. On the other hand, sales volume of automotive aluminum sheet and extruded products held firm on the back of steady demand for automobile parts and components. Reflecting these demand trends in the market, overall sales volume in Japan was roughly in line with the amount in the same period of the previous fiscal year, with flat-rolled aluminum products decreasing slightly and extruded products remaining flat. 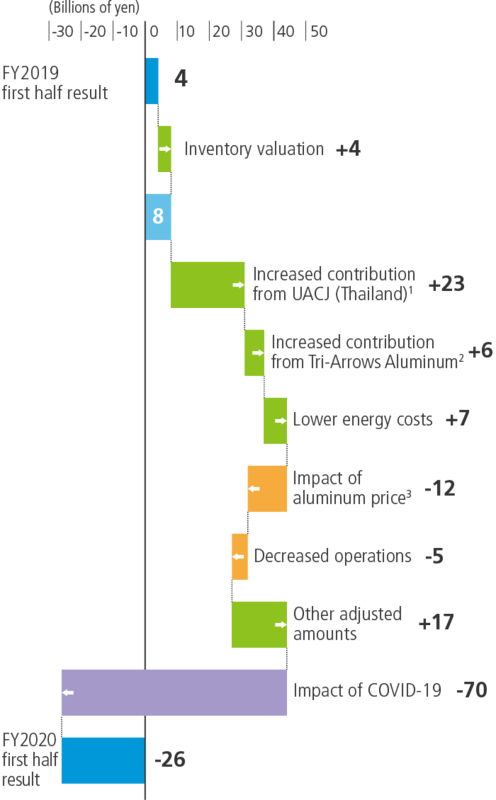 Outside Japan, however, the Group’s flat-rolled aluminum products business posted a year-on-year increase in sales volume, driven by growing orders for can stock at UACJ (Thailand) Co., Ltd., and Tri-Arrows Aluminum Inc.
As a result of these factors as well as increased aluminum ingot prices, consolidated net sales amounted to 330.9 billion yen in the first six months of fiscal 2018, up 9.6% compared with the same period of the previous fiscal year. On the income front, however, operating income decreased 24.9% year on year to 11.9 billion yen, mainly due to rising energy costs and sales delays caused by the natural disasters in Japan. Meanwhile, despite a positive contribution from inventory valuations resulting from the higher ingot prices, ordinary income fell 40.9% to 7.6 billion yen, primarily due to costs associated with strategic investments in Tri-Arrows Aluminum. Finally, net income attributable to owners of the parent came in at 2.4 billion yen, down 65.7% compared with the first half of the previous fiscal year. 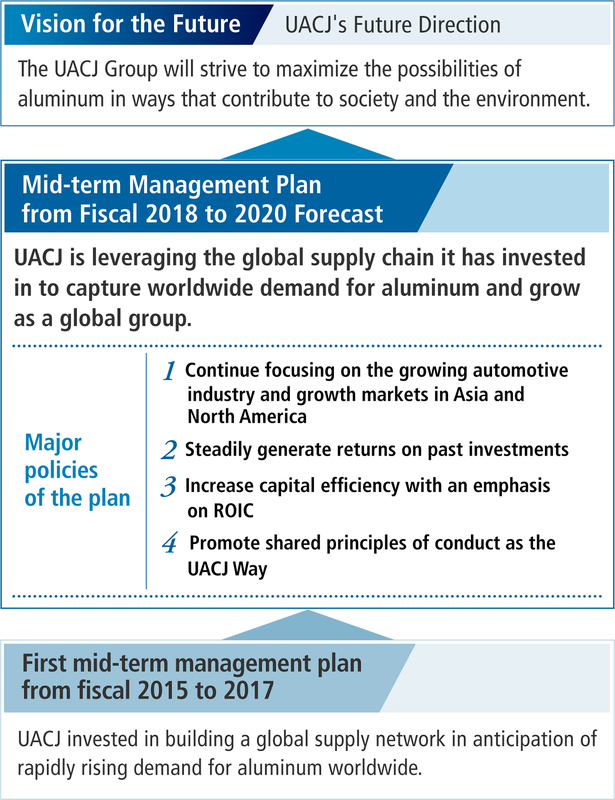 At the beginning of this fiscal year, we announced UACJ’s Future Direction together with the launch of our new mid-term management plan, in which we set financial targets for fiscal 2022 and, as a waypoint in the five years until then, for fiscal 2020. 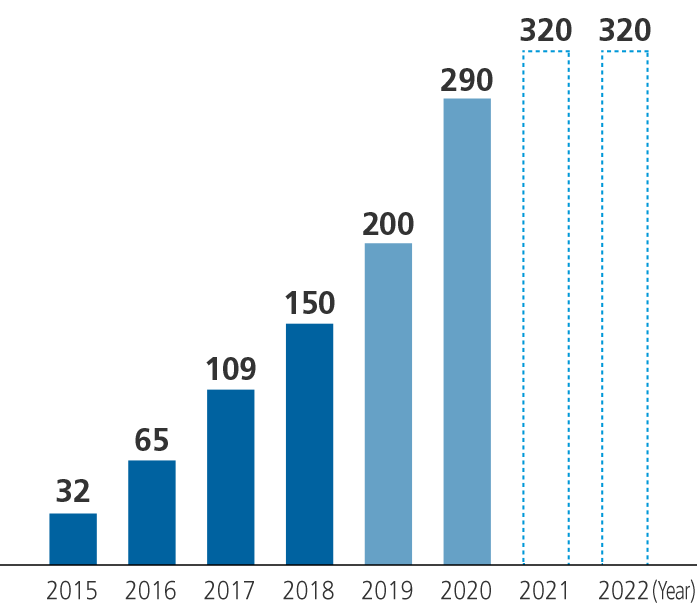 To accomplish those targets, the Group is moving ahead with four major policies. The first is to continue focusing on the growing automotive industry and growth markets in Asia and North America, a policy initiated in the previous mid-term management plan. The second policy is to steadily generate returns on the investments the Company has proactively executed in the past. Third, we intend to increase capital efficiency by giving priority to the return on invested capital (ROIC) in our operational management. Finally, our fourth major policy is to promote shared principles of conduct throughout the entire Group as the UACJ Way. With the first fiscal year of this new mid-term management plan now underway, the UACJ Group already appears to be on track towards achieving the targets. For example, newly expanded facilities have begun operating as planned at Rayong Works, the Group’s large-scale production plant established in Thailand. Based on the new plan, management is committed to maximizing customer satisfaction while ensuring that the Group grows as an enterprise regarded as essential by people worldwide. 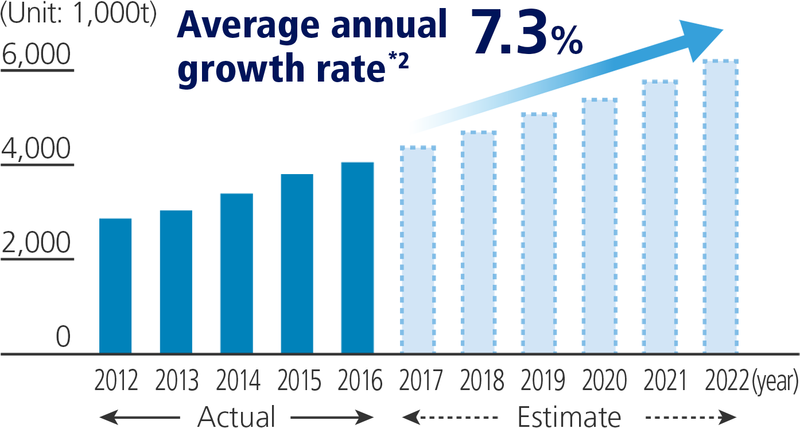 Our full fiscal year forecast is the same as we announced at the beginning of fiscal 2018. We project 670 billion yen in net sales, 28 billion yen in operating income, 20 billion yen in ordinary income, and 10 billion yen in net income attributable to owners of the parent. The Company’s dividend policy, however, has been partially changed. As a means to more flexibly return profits to shareholders based on full fiscal year profits, management decided to abolish the interim dividend and pay a single annual dividend at the fiscal year-end. 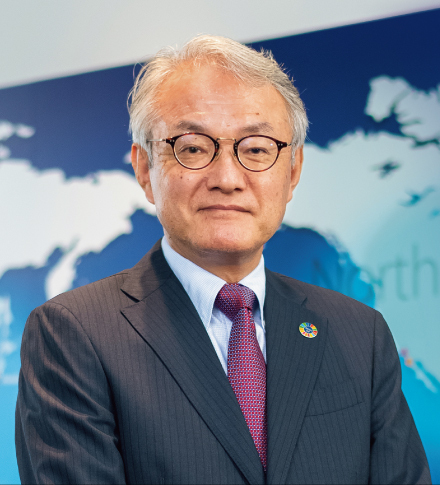 During the period of the new mid-term management plan, we will give priority to using cash flow to invest in expanding production capacity at the Group’s factories overseas and equipping its factories in Japan with facilities for manufacturing automotive parts and components, with a view to increase corporate value overall. At the same time, aiming to clarify planned dividend amounts, we are targeting a consolidated dividend payout ratio within the range of 20 – 30% based on the amount of profit for the full fiscal year. In accordance with this policy, management plans to pay a fiscal year-end dividend of 60 yen per share for fiscal 2018.